The leapers TL-BPDM01 UTG Recon Flex M-LOK™ Bipod Comes In Matte Black and mount directly in your rifle M-lock rail. This is the best adjustable tactical rifle M-Lok bipod with a center height from 5.7"-8" inches. 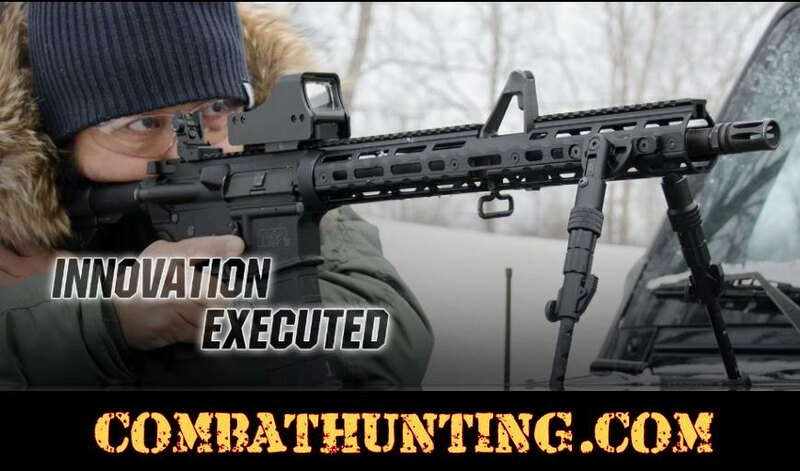 Directly Attaches to M-LOK™ Handguards at the 3 and 9 O'clock Positions. Ergonomic Spring Loaded Slide Locking Ring for Quick and Effortless Bipod Deployment Lightweight Aircraft Grade Aluminum Construction Finished in a Matte Black Anodize. Versatile Bidirectional Bipod Legs with 5 Posi-lock Positions for Use on Different Firearms with Varying Height Clearance and Mounting Real Estate. Fully Adjustable Legs with 5 Precut Extendable Lengths and Flexible In-between Positions Lockable via Thumb Wheel. Equipped with Textured Nonslip Rubberized Foot Pads. Center Height Adjustable From 5.7" to 8.0", Physical Length: 7.4"-10.1", Requires the Length of 2 M-LOK™ Slots Per Leg. UTG Limeted Lifetime warranty. Leapers UTG Recon Flex Bipods take a look at them in action great video brought to you by Leapers features both M-LOK and Keymod bipod.